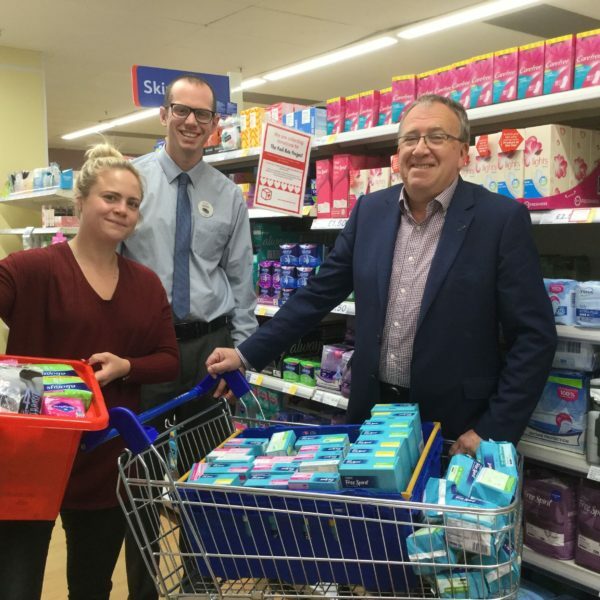 Businesses are being urged to support a Plymouth woman who is single-handedly working to fight ‘period poverty’ in local schools. The Red Box Project is a national scheme run by volunteers who collect sanitary products from donation points and distribute them to local schools. The scheme only began operating in Plymouth six months ago when local woman Lyndsay Whitfield volunteered to take on the role so shocked at the scale of the problem locally. Since then she has worked tirelessly in what spare time she has to set up ‘Red Box Project’ donation points across the city and writing to schools inviting them to get onboard. Lyndsay now has 30 schools signed up to the scheme and has installed ‘Red Box Project’ bins at checkouts in Tesco in Transit Way and Roborough, Morrisons on Outland Road and eight Co-op stores citywide, among other locations. Welcoming the donation, Lyndsay said: “These products will help so many young girls who for whatever reason don’t have access to sanitary products or their families just cannot afford them. Just two of the schools benefitting from the scheme are Stoke Damerel Community College and Hele’s School in Plympton. One of the most popular donation points is the ‘Red Box’ at the checkout of Tesco in Transit Way where customers drop off supplies they have purchased in store.